This past week has been rough for many of us. One thing I know is that, in these uncertain times, it’s important to do something besides worry. Our founders knew this and it’s what motivates us in our work. 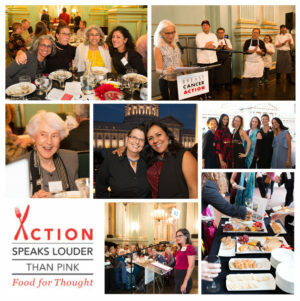 Our annual Action Speaks Louder Than Pink – Food for Thought fundraising dinner isn’t just a party. It’s a chance to come together as a community, tell the truth about the breast cancer industry and raise money for Breast Cancer Action so we have the resources we need to continue challenging the status quo and working to achieve health justice for all women at risk of and living with breast cancer. We hope you’ll join us for an evening of powerful truth telling. In addition to a delicious, four-course, plant-based meal prepared by renowned Bay Area chefs, we’ll share a deeper dive into our 2018 Think Before You Pink® campaign. This year, we’re calling out Ford Motor Company for pinkwashing while driving up the risk of breast cancer. We’ve got a compelling evening planned and we hope to see you there.